Flexi Dollars are “food dollars” that are accessed with a student’s university ID card, and can be spent like cash at dining halls and all on-campus restaurants, cafés, coffee bars, and convenience stores. Flexi Dollars can be added to any meal plan or purchased alone. Faculty and Staff: Make your initial purchase and receive your Flexi Dollar card at the Campus Housing Office (104 Hahn Student Services). 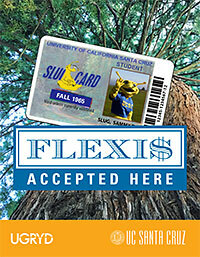 Once you have a card, purchase additional Flexi Dollars at any dining hall. Use at cafés, coffee bars, and all dining halls for flexibility and convenience. Every dining venue on campus accepts Flexi Dollars. Unused Flexi Dollars will automatically roll over from quarter to quarter and to the next academic year. After two years of inactivity on your Flexi Dollars account, any remaining unused Flexi Dollars shall be forfeited and become the property of the University. 10% off dining hall entry: Pay with Flexi Dollars at any dining hall and receive a 10% discount off the single entry price. Free dining hall entry: Add $50+ Flexi Dollars to your card at any dining hall, and get one free entry into the dining hall, to be used immediately following the transaction. Flexi Dollar refunds are available for balances over $10.00. Refund requests are only accepted at the end of the academic year (June 1 – 30). Students can request a refund at Student Housing Online.